That advice has always stuck with me. I used to not be able to handle stress very well, and I’ve worked hard to make it easier for me to handle it. I remember when I used to let my thoughts spiral out of control. Stress was this infinite loop that would be hard to stop. Stress would lead me to sleep less and eat worse, creating more stress, never getting to the root of the problem. When you’re stressed, you don’t think clearly. You make poor choices, and besides the physical and mental effects, it can have a terrible effect on your work. Stress is actually a very positive thing, it all depends on how you see it. The secret to making stress your friend is by looking at it as an opportunity instead of a problem. Much easier said than done, of course. One important thing to remember is that you’re not alone. Many employees across the world report being stressed at work. I’ll teach you everything I can about how to make stress your friend, and how to make stress at work a positive thing instead of a negative one. 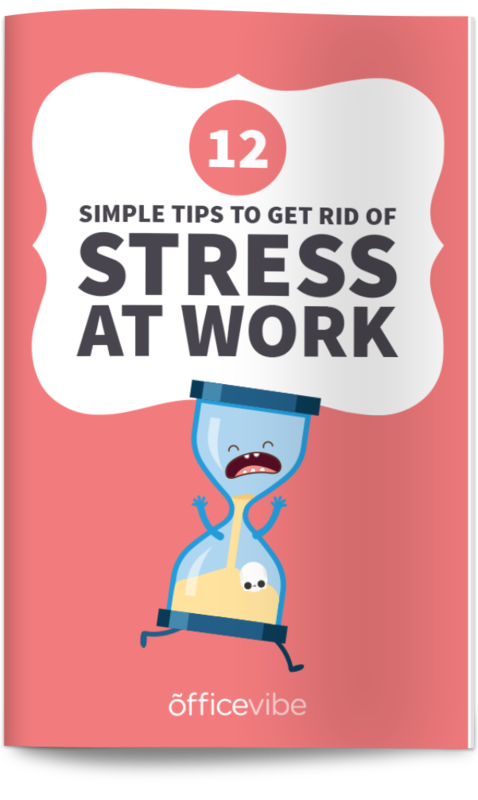 Start with this: Here are 12 simple tips to get rid of stress at work. Before looking at ways to improve your response to stress, it’s important to understand why stress is good for you (always start with why). A little stress at work is a good sign. It means you’re engaged, excited, and passionate about what you’re doing. When you challenge yourself and get out of your comfort zone is when you experience the most personal growth. Making yourself a bit uncomfortable and challenging yourself will make you a bit stressed. That’s okay, that’s part of life. Embrace it. Research has shown that stress can improve your working memory and focus, making it an incredibly positive thing for the workplace. The reason for this is that when you’re stressed, your body tries make you more alert, putting itself in that “fight or flight” mode. When you’re stressed, your body produces hormones to fight off illness and keeps your body healthy. Stress helps you boost your immune system, which is good for both work and your personal life. Important: Like most things in life, there is a limit to how much this will work. When stress becomes too high, it causes damage, but a “good” amount of stress can be a positive thing. Knowing this, the trick is to do things to manage your stress every day, so that it never reaches that high point. One of the main reasons we need to stop being so scared of stress is that stress is actually good for your performance. When we’re not stressed enough, we become bored, and that’s never good for our motivation or productivity. When we’re too stressed, we become overwhelmed and can’t handle the workload we have. What we want to find, is that perfect sweet spot in the middle that leads us to peak performance. It’s easier said than done to find that sweet spot, but that’s what you need to work on to hit ultimate productivity. At the root of reducing stress, is being more mindful and building better habits into your life. Now here are a few simple tips to help you make the most of stress. This is without a doubt the best tip to reduce stress from your life. Personally, this is the thing that I’m working the hardest to fix, and it’s what I struggle with the most. I get very sensitive when people critique my work, but for the last couple of months, I’ve been working hard to make myself more vulnerable, and look at feedback/criticism as a positive thing. You need to see it as an opportunity to grow and get better, not as a personal insult. If you want to learn more about this, I’d recommend reading one of my blog posts called Why You Need To Develop A Growth Mindset. When someone with a positive attitude or a self-confident attitude experiences stress, they respond better to it then someone who doesn’t have as much confidence. If you build up your confidence, you’ll be able to deal with the pressure of those situations. Building your confidence takes time and effort, and happens through things like positive self talk, building a growth mindset, and doing things to make you happy. If you want to learn more about building your confidence, read my post called Why Confidence Is The Secret To Success In Life. Having a few close, strong connections with people that you can turn to during stressful situations is a great way to make handling stress easier. One of the most powerful ways to reduce stress is to release a chemical in your body called Oxytocin, and one of the ways to do that is through social contact and support. If you’re a regular reader of the blog, you’ll notice that I continuously mention exercise as a thing to do improve your mental health, response to stress, and overall quality of life. Specifically, exercise helps us respond to the initial threat of stress better. We’re stronger (mentally and physically), so we are better equipped to handle it. I’ve noticed that ever since I’ve started exercising again, my stress levels have gone way down. I’m just happier with life overall. You need to learn how to relax and stay calm. This is the type of stuff that you need to build as a habit into your daily life. Like I said, stress will come into your life whether you like it or not, but if you can build relaxation habits into your life, you’ll handle the effects of stress better. Before you reply to that email or make that phone call, get up and go for a walk. It doesn’t have to be for long or very far, but going for a walk to calm you down is a great way to relieve some stress. I know that whenever I start to feel overwhelmed or stressed out, I get up and go for a walk in the building I work in, just to let my mind wander. It really helps to calm me down. Plus, it’s a great way to get up and stretch your legs. It’s not good to be sitting at your desk all day. As you noticed, these things are easier said than done, but the trick is to start small, and have a really experimental mindset. Test different things to see what works best for you or where you could improve. Don’t forget: Get these 12 tips to get rid of stress at work. Be mindful of what’s going on in your life and be grateful for what you have. You can manage stress so that it doesn’t get the best of you, and live a productive, happy, and healthy life. Let us know your best stress-reducing techniques in the comments below!